Popular single layer designation in Germany, which is mostly on the soil type refers. The aligned to the west-northwest to south-southwest vineyard with 20 to 60% slope covers nearly eight hectares of vineyards on granite weathered soil. 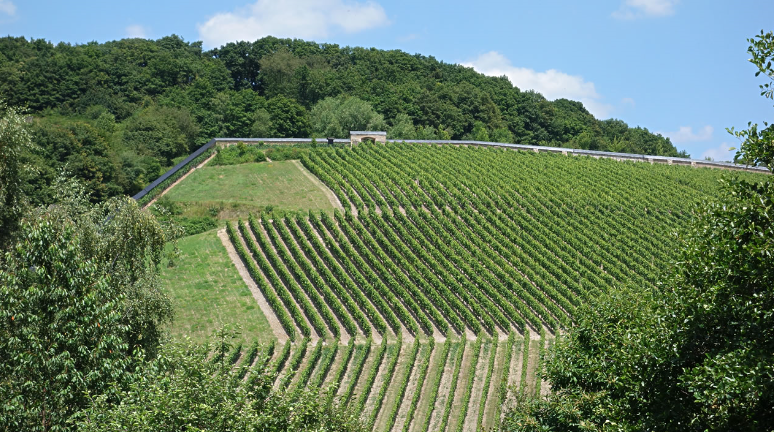 Here are mainly the varieties Klingelberger (a special clone Riesling) and muscatel cultivated. Shares in the situation, for example, have members of Durbacher Winzergenossenschaft as well as the winery Huber Alfred. Steinberg has been part of the wine law since 1971, so there is no additional mention of the place name Hattenheim, but only "Steinberger" appears on the bottle label. The Steinberg is perhaps the most famous location in Germany and was already the favorite vineyard of the Cistercian of the monastery Eberbach, The Steinberg was already listed in 1211 in the goods list "Oculus Memorie" and was at that time already surrounded by stone walls. At that time it was probably just the upper, steep and stony part of today's location. The almost three kilometers long and three to five meters high wall is provided with a slate roofing. It covers the entire vineyard and was built for the most part in 1766 under the abbot Adolph II Werner von Salmünster (1750-1795). Originally, it was intended to ward off grape kidnappers in autumn, but at the same time protects against seeping cold air, which gives the vineyard a climatic special status. In 1836 there was an extension to the "small Steinberg". Other individual layers with this name exist in the municipalities or growing areas Bad Dürkheim (Palatinate), Bad Kreuznach (near), Beilstein (Württemberg), Bollschweil (Baden), Dalheim (Rhine Hesse), Gröst (Saale-Unstrut), Guntersblum (Rheinhessen ), Michelbach (Franconia), Partenheim and Wackerheim (Rheinhessen). This page was last modified at 23 April 2018 at 10:28.